Presence 2017 keynote “voice” Furtick claims to be “the son of God”? Steven Furtick is internationally recognized as King of the Narcigetes for a good reason: he seems to only read himself into the biblical text. The problem with this hermeneutical approach is that Jesus says that the scriptures point to Him. Because of this, many people consider Elevation Church a cult because how Steven Furtick elevates himself to a messiah-like status. The below video snippet further strengthens the case that Elevation should be avoided. 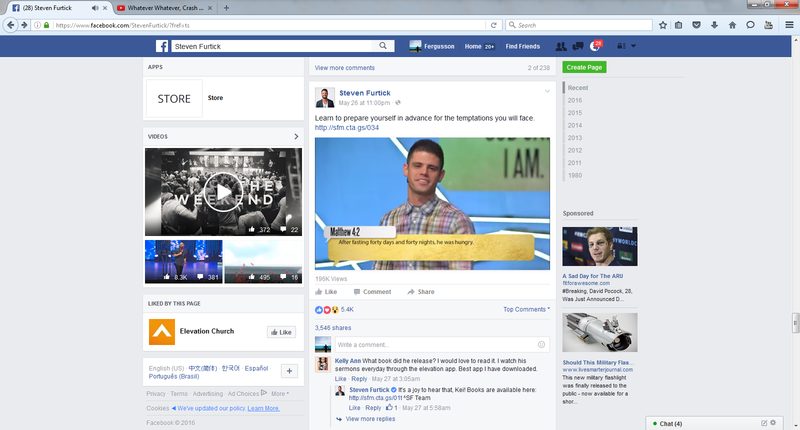 This linked video below was uploaded by Elevation Church on to Steven Furtick’s Facebook account. To those he acknowledges in his sermon who don’t believe in the devil, we can only conclude that they are to assume that they have the devil within themselves to speak to. Furtick claims the “Father” spoke to him that morning, reminding “me that He loves me and that He’s pleased with me”. So Furtick is NOT talking about Jesus here – he is talking about himself. The Messianic Furtick is the one on stage now speaking. Why did he do this? We can be considered sons of God if we are forgiven through Christ’s atoning work and born again by His Spirit. Why did he change the topic? We’ve often observed in the church how Satan is using ministers to tempt the body of Christ to speak to their circumstances (turn stones to bread); to step out in faith (or off the boat) so God can work the miraculous to make their testimony powerful (step off the temple); and to submit to “the vision” so you can expand your ministry through the nations (bend the knee to Satan to gain the world). In this snippet that Elevation Church uploaded, Furtick isn’t even hiding it. He is claiming his (lower case) “god” will turn the stones to bread “because god says I can”. At least Furtick has made it clear who his god is. “If you are the son of god? You don’t have to tell me who I am! I know who I am. I’ve always been the Son of god. I’ve always been a child of god. In fact I just spoke with my Father this morning and He reminded me that He loves me and that He’s pleased with me! I’m not the ‘son of god of god+’ that you say I am! I’m a son of god because god says I am. I’m not confident because of what I can do, I am confident because of what god says He WILL do! I’m not forgiven because I’ve earned acceptance, I’m forgiven because god says He has forgi- help me preach! Probably would chill on throwing stones of judgement. You can choose to take things out of context on purpose if you’d like, but I think you’re fighting the wrong enemy here. And would that observation be because you have invested a large part of your life into C3 School of Ministry as some former students (now set free from those false ties that bind) and who comment here? Steven Furtick (born Feb. 19, 1980) is the founder and pastor of Elevation Church in Charlotte, North Carolina. He “attended North Greenville University, received a B.A. in communications, and went on to complete a Master of Divinity from Southern Baptist Theological Seminary.”1 His church has over 10,000 attendees on a weekly basis. He has experienced rapid church growth, and he is building various campuses where church services are expanding. His church started with 19 people in 2006 and is now at over 9,000 as of 2012. He attributes the growth to “the jars.” As he says, “the oil is something only God can give. It represents his spirit, his presence, his power . . . “, etc. 2 He is right to give God the glory. He promotes Christ, has positive messages about what God wants for his people, and reaches out in faith to expand the kingdom for God. This is admirable, and we should applaud him for it. Steven Furtick says that he wants Elevation Church to be . . . This is fine. Preaching Jesus so people can come to know Him is admirable and is one of the things the Christian church is supposed to do. However, shortly after the above quote in the same video and after speaking of multiple conversions occuring at his church, he said . . . The problem with Mr. Furtick’s comments is both subtle and profound. The Doctrines of Grace are often described by the acronym TULIP. Total Depravity, Unconditional Election, Limited Atonement, Irresistible Grace, and Perseverance of the Saints. This is often called Calvinism. In other words, the doctrines of grace affirm that man is completely lost in his sin and it is only by the grace of God through the person of Jesus that salvation is possible. It is not up to man’s sinful free will but God’s sovereignty over His creation (Rom. 9:22-23, Eph. 1:4-5). It further states that because of man’s enslavement to sin, he is unable to freely choose God (1 Cor. 2:14). Therefore, the doctrines of grace include God’s electing and predestining people to salvation (2 Thess. 2:13), which is by God’s choice, not man’s (John 1:13, Rom. 9:16) and that the saved are eternally secure because their salvation rests in Christ’s work, not man’s faithfulness (John 10:27-28). Now, whether or not you agree with these doctrines, the truth is that they affirm the greatness of God and His sovereign work of saving people. They are held by millions of Christians all over the world. Mr. Furtick is entitled to not agree with the doctrines of grace but to mock them as he did is uncalled for and is potentially a serious spiritual error on his part. It seems that he is not only ridiculing those who hold to the doctrines of grace but also he is mocking the very doctrines which the Scriptures teach. Is not God a God of grace? Of course He is (Rom. 3:24, 11:6, Eph. 2:8, 2 Thess. 1:12). Mr. Furtick’s mockery divides the body of Christ, helps to create a holier-than-thou attitude, and potentially risks a direct violation of Scripture. Women pastors in the church have been debated for many years. However, just because something is debated, doesn’t mean that both sides have valid arguments. The issue is not if a woman is an international speaker, great musician, great parent, etc. Instead, we must ask if having a woman preacher is what the Bible affirms. It is not. “For this reason I left you in Crete, that you might set in order what remains, and appoint elders in every city as I directed you, 6 namely, if any man be above reproach, the husband of one wife, having children who believe, not accused of dissipation or rebellion,” (Titus 1:5-7). (Literally in Greek, the phrase “husband of one wife” is “a man of one woman’). That’s because Bible-illiterate you listens to the devil. The devil loves your anti-biblical “do not judge” doctrine. Furtick doesn’t preach the true Gospel, doesn’t teach the Bible in accordance with rightly dividing, and has collected goats in a place to hear him speak about how wonderful he is. If we were forced to examine fruit of someone’s eternal state, I’d have to say that Furtick needs to hear the true Gospel preached to him. I think that shirt’s enough not to watch it…. Uhm…I think Fertick (hahahaha – auto correct wanted to call him ‘fruitcake’) is role playing Jesus speaking to the Devil in that segment – he’s not at all saying that HE is the son of God. At 1.52 Fertick points out that Jesus was “pre-loaded with the answer – because you’ve got to decide what to tell the Devil before he ever knocks on the door” and then he goes on to paraphrase or dramatise what Jesus was saying based on a very correct biblical point of view. There is not a single thing that Fertick says in that clip that is not correct. There is a whole lot of other stuff that Fertick has got going wrong with out yo laying false accusations against him. So – anyone going to say something about this? Fertick is NOT calling himself the Son of God – for dramatic effect he is dramatising what he thinks jesus was saying the Satan as he talked to him in the desert. Furtick is a clueless moron; no one cares what he thinks. Except that he;s being accused of saying that he is the son of God when clearly he hasn’t. I don;t like Steven Furtick either – but there’s enough that;s wrong that’s true, without having to make up things he’s saying that are wrong. Sop how about it = let me post and I’ll be a nice boy? You’re not blocked – all comments go into moderation. Moderators have a life apart from approving comments 24/7. I realise that sometimes comments go into moderation – but the comments I’ve made on some posts don’t even appear after I hit POST COMMENT – its a mystery wrapped in a conundrum wrapped in a riddle!